Additional notes: This is the third and final book in the Days of Redemption series. You can read my review of the first book here and my review of the second book here. My thoughts: I think from the first book, I was really just waiting to read Elsie's story. She is such a little firecracker and yet so vulnerable due to her eye disease and her family. They are quite overprotective! It's easy for her to let her family speak for her, but she must learn to stand on her own two feet. Elsie's character really hits home for me. I have my own opinions but in an extended family like mine, my opinion often gets lost because I'm not the one shouting. So no one can hear me. I remember always running to my parents for their opinion when Jason and I were in a serious relationship. That all changed the day we married - he was, from that second on, the head of our household and the head of me. Thankfully, I married a godly man, and he answers to God first and foremost. That makes it very easy for me to feel safe and comfortable with being the second in command at our home. Anyway, I was so happy with this story. 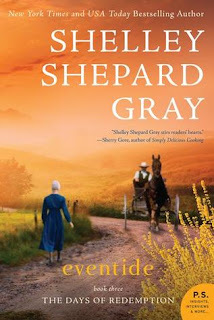 A little predictable, but it's predictable for Amish fiction to be predictable. I think that makes sense! If you like Amish fiction, you will adore this story.